New release out this month from Stereo Productions and is the seventh edition of BPM titled “Stereo Productions goes to Playa del Carmen” . BPM is the first project for Stereo Productions in 2014 with this release consisting of twelve different tracks selected with great care by artists Chus & Ceballos for Techno and tech-house flavors. Additional contributions are provided by Christian Smith to include Oscar de Rivera. “Stereo Production goes to Playa del Carmen” Is the title under which you will find distinct work by many colorful artists that come together to express sensations under one beat driven soul, to create a must have record. Stereo Productions gives a nod to Mexico’s well-known party scene by the title. This release of big productions and new revelations will be showcased by Stereo Productions in Koolbeach on January 5th. The performance will also include other artists such as Richie Santana, Peter Bailey, and Alx. The album, which was made exclusively for broadcast on Beatport opens with Blowin’ Minds, a production featuring Chus & Ceballos in special collaboration with Oscar Rivera. Get ready to experience fine sounds with a rising melody flow, accented by intermingled sharp staccatos. Christian Smith, commander of Tonic, puts the icing on the cake with The Exchange, through a clean, bold sound to which we are accustomed. The club beat with a dark base loop correctly continues the journey of this album. Rafa Barrios also contributes to the record with his new release “Big Heart” by Intec Digital. Rafas’ work on Big Heart has been able to go beyond the confines of mainstream to create a unique tech-house sound; a danceable mental trip, perfect for bringing in the New Year. Rafa is an Emix Radio favorite and has produced works over the past year that we have highlighted. This crazy-talented line up of starr-studded DJs makes this soundtrack perfect for one of the world’s most important festivals. “Stereo Production goes to Playa del Carmen” is one release you will not want to miss. From the musical streets of Glasgow, Scottish DJ & recording artist Paul Mendez is an expert in EDM and multi genre open format sets creating live mash ups on the spot with no 2 sets ever the same. Paul Mendez is a true world class talent that can rock 100,000 people at a festival, 5000 in a big room super-club & 100 in an intimate lounge. He is a flawless tactician and researches and co ordinates his sets for each venue with an eye always on the dance floor weaving between genres to keep everyone happy. Paul’s music production career has been successful for 16 years, and has been an integral part of labels such as ID&T, Bonzai, Hook Recordings, Armada and Absolutely records. He has just signed an artist album deal with Universal Australia for release late 2013 with the 1st single ‘Beachside’ currently charting at number 7 in the Australian singles chart. As a producer & recording artist Paul creates monster tracks for styles such as Big room EDM to Pop/Dance to underground techno with a slice of Trap & hip hop thrown in. Paul is followed by most Major DJ’s and has remixed & collaborated with artist like U2 , Jay Z, Avicii, Calvin Harris, Busta Rythmes, Example, Rudimental, Icona Pop, Afrojack & Robin S. Find out more for yourself ….Listen and get a free bangin’ Paul Mendez session mix below. 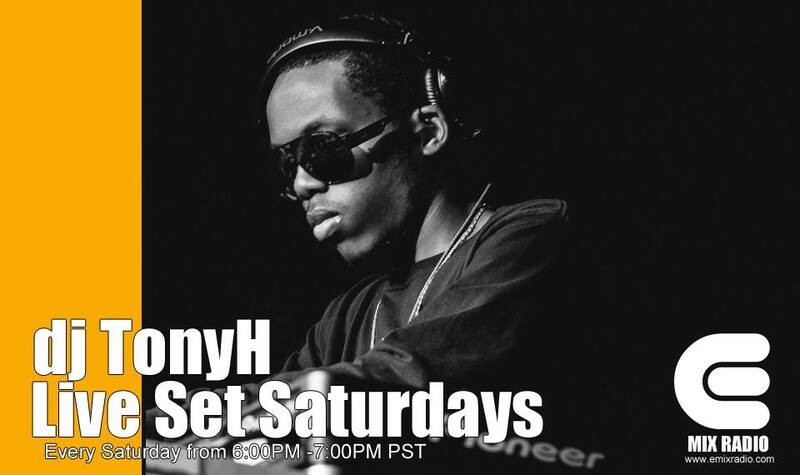 Out now is latest session from dj TonyH “Live Set Saturdays” and this mix is off the chain. Love it love it Love it …… Do we need to say more. Tony blends a mixture of Tech House and beats to groove your soul. If you missed the show you can download it for your collection. Catch dj TonyH every Saturday evening on Emix Radio from 6:00PM-7:00PM PST.